LOS ANGELES, CA, February 8, 2019 – The Academy Software Foundation (ASWF), a neutral forum for open source software development in the motion picture and media industries hosted at the Linux Foundation, today announced that OpenColorIO (OCIO) has been approved as the Foundation’s second hosted project. Initially developed by Sony Pictures Imageworks, OCIO is an Academy Scientific and Technical Award winning color management solution for creating and displaying consistent images across multiple content creation applications during visual effects and animation production. OCIO is a fundamental tool for animation and VFX production and has been used on dozens of feature films including Spider-Man™: Into the Spider-Verse, Spider-Man™: Homecoming, Hotel Transylvania 3, Ghostbusters, Alice in Wonderland, Cloudy with a Chance of Meatballs, Surf’s Up, and Watchmen. Based on development started in 2003, OCIO enables color transforms and image display to be handled in a consistent manner across multiple graphics applications including compositors, image playback tools, renderers and color grading. It is compatible with the Academy Color Encoding System (ACES) and is natively supported in commercial applications like Katana, Mari, Nuke, and Silhouette FX, among others. Launched in August 2018 by the Academy of Motion Picture Arts and Sciences and the Linux Foundation, Academy Software Foundation provides a neutral forum for open source software developers to share resources and collaborate on technologies for image creation, visual effects, animation and sound. The Foundation is also home to OpenVDB, an Academy Scientific and Technical Award winning industry standard developed by DreamWorks Animation for creating more detailed and realistic volumetric images. LOS ANGELES and EDINBURGH, UK, October 23, 2018 – The Academy Software Foundation (ASWF), a neutral forum for open source software development in the motion picture and media industries hosted at the Linux Foundation, today announced that Sony Pictures Entertainment/Sony Pictures Imageworks, Warner Bros., Blender Foundation and Visual Effects Society (VES) have joined as members. ASWF also approved OpenVDB, open source software developed and maintained by DreamWorks Animation, as the Foundation’s first hosted project. 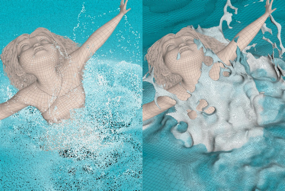 OpenVDB is an Academy Award-winning industry standard for creating more detailed and realistic volumetric images, including water/liquid simulations and environmental effects like clouds and ice. Launched in August 2018 by the Academy of Motion Picture Arts and Sciences and the Linux Foundation, ASWF provides a neutral forum for open source software developers to share resources and collaborate on technologies for image creation, visual effects, animation and sound. DreamWorks Animation developers used OpenVDB to produce many environmental effects including water scenarios in The Croods. Originally developed and maintained by DreamWorks Animation, OpenVDB is the first project to be hosted by ASWF. OpenVDB is an award-winning, open-source C++ library for volumetric representations including fluid simulations, animated volumes and environmental effects. It has been adopted as a key technology for effects on feature films such as Boss Baby, Trolls, and the up-coming How to Train Your Dragon: The Hidden World. The ASWF will maintain and further develop the project with oversight provided by a Technical Steering Committee (TSC). Developers interested in learning more or contributing to OpenVDB can sign up to join the mailing list at www.aswf.io/community. ASWF welcomes four new members: Sony Pictures Entertainment/Sony Pictures Imageworks as a Premier member, Warner Bros. as a General member and Blender Foundation and Visual Effects Society as Associate members. “We are pleased to be joining the Academy Software Foundation in helping to drive the next wave of innovation for our industry. With increased collaboration, we expect accelerated growth in the development of new technologies and standards for artists and engineers across the industry,” said Randy Lake, President, Studio Operations and Imageworks for Sony Pictures Entertainment. ASWF is a cross-industry initiative working to increase the quality and quantity of open source contributions by developing a governance model, legal framework and community infrastructure that lowers the barrier to entry for developing and using open source software. Developed in partnership by the Academy of Motion Picture Arts and Sciences and the Linux Foundation, the Academy Software Foundation was created to ensure a healthy open source community by providing a neutral forum for open source software developers in the motion picture and broader media industries to share resources and collaborate on technologies for image creation, visual effects, animation and sound. For more information about the Academy Software Foundation, visit https://www.aswf.io/. For more information about the Academy Software Foundation, visit https://www.aswf.io/.